The other day Sean told me that he had a little something for Christmas for me. "Not much, just something to remind you of the good days." I started crying. 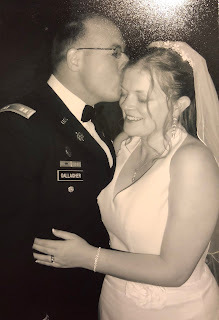 Thankfully, not full-on sobbing as any military spouse will tell you just eats up precious phone minutes and only adds a feeling of guilt that a phone call was wasted because you couldn't control your emotions, but quiet tears that I wiped away as we continued to talk. I was crying for a lot of reasons; physical fatigue, emotional fatigue, gratitude, joy, but mostly hurt. Hurt because this year has been hard but it has also been good, and I was afraid that I hadn't been able to convey that sentiment to my husband who was far away in not-so-friendly territory, working seven days a week with few home comforts. Had I been so focused on what I was going through that I hadn't told him all the good things? Did I not spend enough time trying to make him understand that not everything at home was Little Man getting locked in cars and Sweet Girl refusing to eat chicken? After we ended our conversation, I took a deep breath and reassessed the situation. I'm pretty sure he knows that we had good days here. I'm pretty sure he knows that we think when he walks off the plane tonight that this will be the best day. I'm pretty sure about all of this, and tonight I'll talk to him about in person to make damn sure. 365 days, not including his 2 week R & R, without him here was hard. 365 days of "Daddy's at work." was hard. 365 of Little Man growing and calling the telephone "Daddy" was hard. 365 days of life; doctor's visits, school functions, holidays, birthdays, potty training, diaper changing, grocery shopping, movie watching without him was hard. But it's still good. The kids managed to smile and grow, even laugh some, and learn new things without Daddy being in the room or in the country. 365 days that saw milestones, setbacks, laughs, tears, grins, hugs, tantrums; hard days but good days. At the end of this 365 days we are still a family. We are still here and Sean will be here soon. And I am so grateful for those 365 days and even more humbled by the days to come because no matter how hard it was, it is about to be over. And there are so many families for whom 365 became forever. For the ones who had to answer the door or pick up the phone to hear that 365 was meaningless, my heart aches. There is a part of me that will be sad amongst the joy tonight because not everyone who left is coming back. During our 365, we grew up apart but that's ok. We're supposed to keep growing. We can still have good times apart while wishing we were having good times together. And soon we'll have that opportunity. The days were hard but they were good because we had them. For everyone still counting down their 365, I hope the days fly with meaningful moments and the nights swiftly go with restful sleep and thoughts of loved ones geographically far but emotionally present. During our 365 I prayed for safety and overall well-being for all those deployed and all those at home. I will continue that prayer - it's the least I can do. And when another 365 comes up for us, I'll keep on praying the same thing. I know we didn't do our 365 alone. I owe an enormous debt to my family for all they've done for us. I know that there are people praying for us and wishing us happiness and that is humbling. Thank you. We didn't do this alone and I hope no one ever has to. I feel like this has turned into a farewell speech for a deployment beauty queen (a position for which I am ridiculously under qualified), and that was not my intent. I wanted to say how happy I am to see Sean, how grateful I am that I get to do so in these circumstances, that I owe many people many things for helping us this year, and that this deployment is over for us but it isn't over for everyone. I wanted to say that this was hard but I know people go through much worse everyday. I wanted to say this was a good year. But I'm glad to be moving on. I wanted to say that I love you, Sean. Welcome home. Oh what joy, what sadness, what wonder, what humbleness. 365 is a long time, but you are right because how blessed we are that our 365 is coming to an end and a new 365 new and exciting days will soon be beginning. Let us not forget how blessed we are that God knew when to station you close to us so we could give you what simple help we could offer. Let us not forget how blessed we were to see a little girl grow and develop in so many ways, how blessed we were to watch a tiny baby boy grow into a wonderfully joyous toddler and how blessed our family is to have you as a part of it. Enjoy your day and we will continue tosay our "thank you" to the one who made all of this possible. At the end you were able to put all of it into perspective. Not to say that it was never there, but along the way may have gotten a little cloudy. God Bless you, Sean, Little Man and Sweet Girl. Thank you, God, for bringing Sean home safe and for giving him such an inspirational, strong, young woman as a partner! Gosh, you lose power for seven plus days and the whole world changes! Wahoo for Sean's safe return! When I have Internet again I'll write more but this tiny iPhone keyboard is killing me. And you know, this moment is all about me. Oh, I want you to know you're still outstanding, but now you're also Notable! If you still check in, I want you to remember you're Outstanding, Notable, and Delightful, dahling!